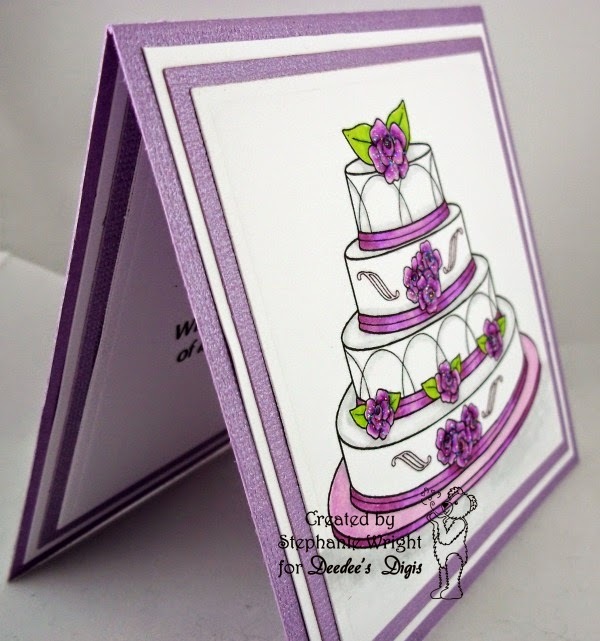 Deedee's Digis is sponsoring this week's Fan-tastic Tuesday Challenge #79 which is to make a wedding card. My niece got married last Saturday and loves purple. 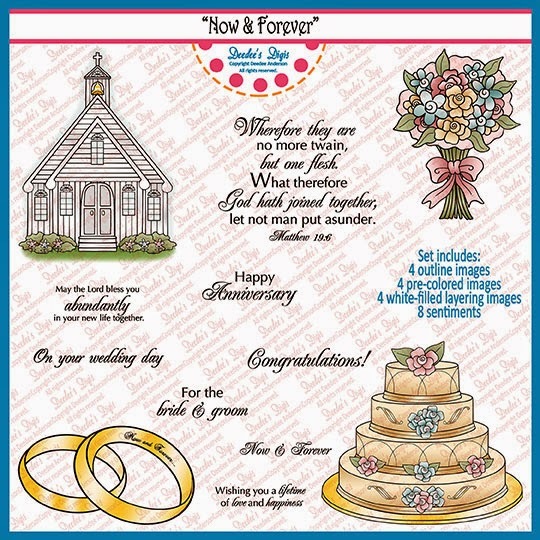 I used Deedee's Digis Now and Forever set to make a quick card for the new Mr. & Mrs. 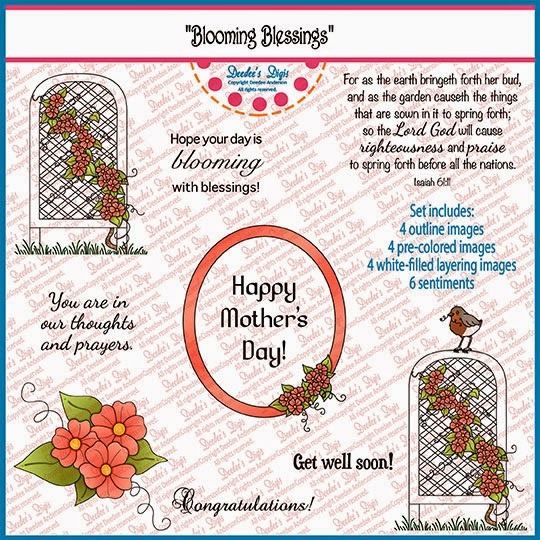 This set has four great images in 3 formats, and 8 sentiments. It's perfect for all your wedding card needs. 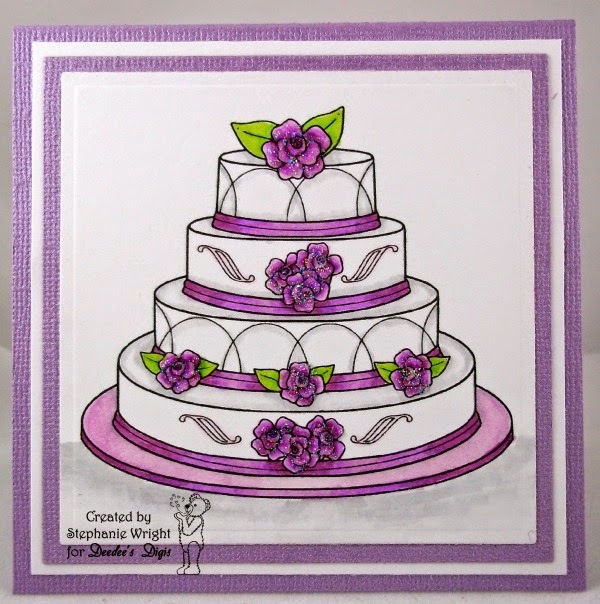 For the front of my card, I colored the cake with Copics to have purple flowers and ribbons. After die cutting it with a square die, I matted it a couple times before adhering it to a 4" square card base. Stickles were added to the flowers for some sparkle. Since we were enclosing a gift card, I kept the card fairly flat so that it would mail easily. The interior uses another image from the set as well as one of the images. The image was colored with Copics. 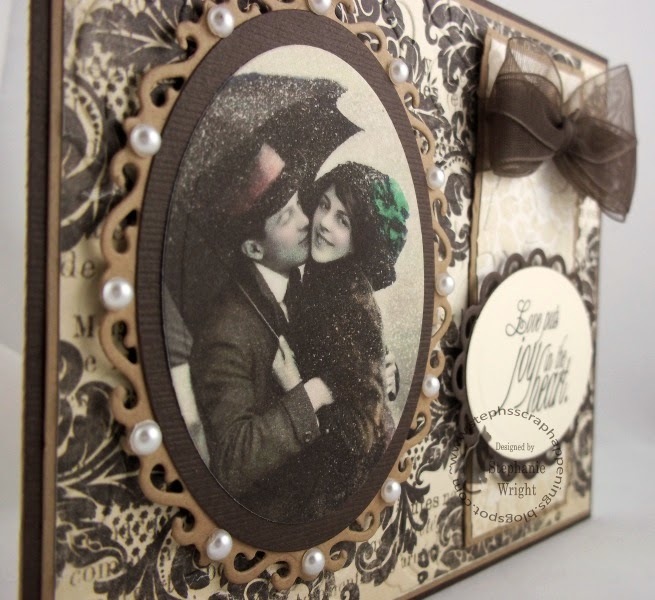 This is a simple little card but I think it also has a very elegant look. Thanks for visiting with me today. I hope you'll be able to play along in the Fan-tastic Tuesday Challenge and have an opportunity to win some free Deedee's Digis. I'll be back tomorrow with another way you could win some free digis from Deedee's Digis. It's Wednesday and that means it's time for another challenge at Word Art Wednesday. 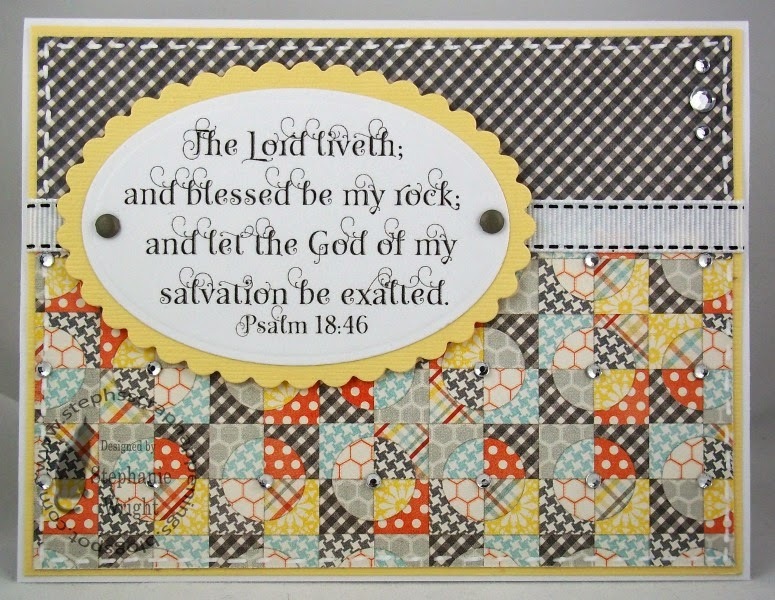 This week is a reminder that, "The Lord liveth; and blessed be my rock; and let the God of my salvation be exalted." Psalm 18:46 I'm so glad that we serve a risen Savior. He is our rock and fortress both in good times and bad. We think of Him as a rock of safety when we're having a difficult time but He is also our rock during good times too. I think we can enjoy the good times more knowing that we are standing on a firm foundation. He does so much for us and has provided salvation for us. Yes, His name should definitely be exalted!! I kept my card simple this week and let the Scripture be the focal point. I really enjoy this paper that looks like a quilt. I accented the centers of the design with some baby bling. 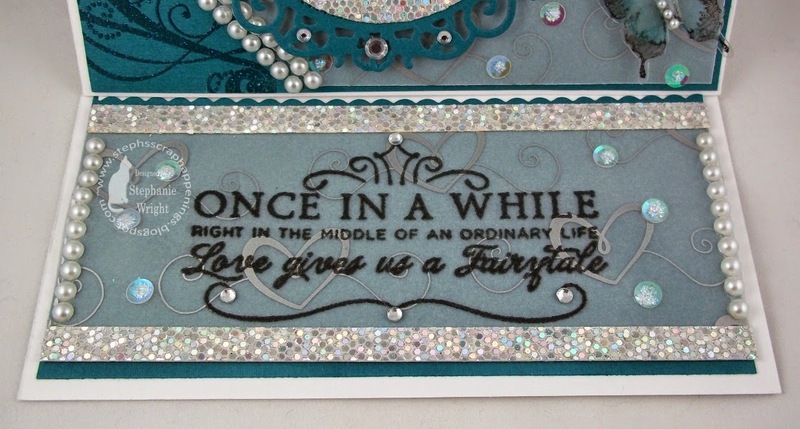 A little ribbon, a little faux stitching, a couple brads and rhinestones and this card is done. This is my version of a CAS card. Thanks for stopping by today. I hope you'll be able to stop by the Word Art Wednesday blog to get your free digi and see the rest of the Design Team projects. Today starts a new Digi of the Month Challenge at Deedee's Digis. You must use the Digi of the Month set to participate in the challenge. If you participated last month, you will receive this month's set for free. If you didn't participate, then it's available for purchase in the store for a greatly reduced price. Each month you participate in the challenge, you receive the next month's set for free. This month's set is perfect for Mother's Day, feminine birthday cards, or just to let a friend know you're thinking of them. I chose to use some of the pre-colored images in the set. 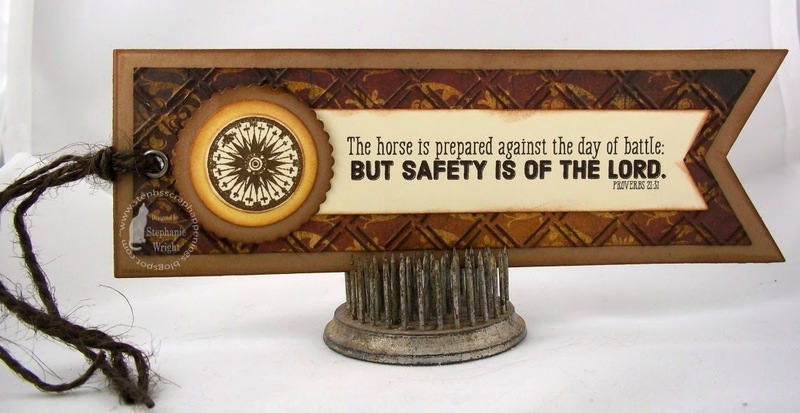 In Word, I layered the sentiment over the oval frame. The frame comes with some small flowers on the lower right side. However, since I was fussy cutting this, I made it easy on myself and fussy cut some of the individual flowers and just layered them on top. I also added a group of flowers to the top of the frame. The centers of the flowers were given a drop of Star Dust Stickles (my all-time favorite in the Stickles line). I added shading around the interior of the frame and around the flowers with Copic Markers. The image panel was matted with a doily die cut and then popped up over the layered background. A sketch from Tuesday Morning Sketches (#292) was used for the card design. The interior sentiment is not from Deedee's Digis. I'd forgotten to print the interior panel and my hubby was taking a well-deserved nap. I didn't want to printer to disturb him so I just stamped the interior greeting with VersaFine ink. Thanks for visiting with me today. I hope you'll be able to play along in this month's challenge. We love to see what you make with Deedee's Digis. When I saw the WORDart for this verse, I thought it would be perfect for a bookmark. I really like the papers in this BoBunny paper pad and decided to use some favorite techniques with them: inking and dry embossing. I inked the edges of all the papers in Chestnut Roan chalk ink. After dry embossing the patterned paper layer, I used the direct to paper technique with Walnut Stain distress ink. After stamping the compass image with the same Distress Ink, I die cut it and double matted it on two more circles. After adhering all the layers, a metal eyelet and some rough twine finish it off. Since I wanted it to stay flat, I resisted the urge to put some bling in the middle of the compass. :) I love to read so this bookmark will be put to use pretty soon. Thanks for stopping by for a visit today. I hope you'll be able to come back soon. Please take some time to visit the Word Art Wednesday blog to see the projects made by the rest of the Design Team and to pick up your free digi. Have a good week!! I'm back today with another project for my Guest Design Team spot at the Path of Positivity Challenge Blog. You can see my first project for them this month using a Lunagirl image here. As a reminder: The theme word for this month is Serendipity. Serendipity means "fortunate happenstance" or a "pleasant surprise" (source: http://en.wikipedia.org/wiki/Serendipity) or luck that takes the form of finding valuable or pleasant things that are not looked for. (source: http://www.merriam-webster.com/dictionary/serendipity). As I thought about what to do for my second project, I realized what could be a better example of "serendipity" than a fairy tale? Fairy Tales are full of fortunate happenstance and pleasant surprises. 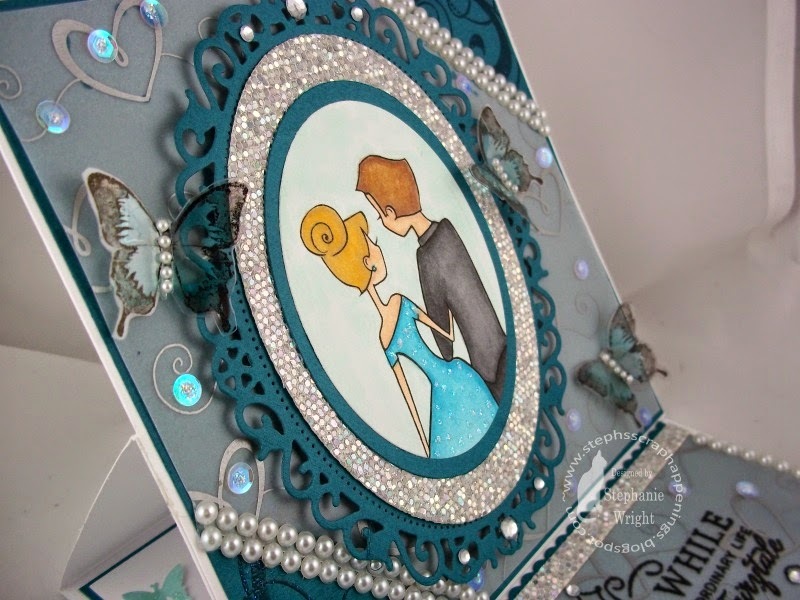 When I showed the colored image on today's card to our daughter-in-law, Amy, she said, "that looks like Cinderella!" So, a Cinderella theme emerged. Amy gave me some ideas for ways to incorporate the theme and even sent me a sketch to use. I love having a crafty artistic daughter-in-law. Since we live 8 hours apart, our crafting now takes place via texts and phone. I'm thankful for technology. 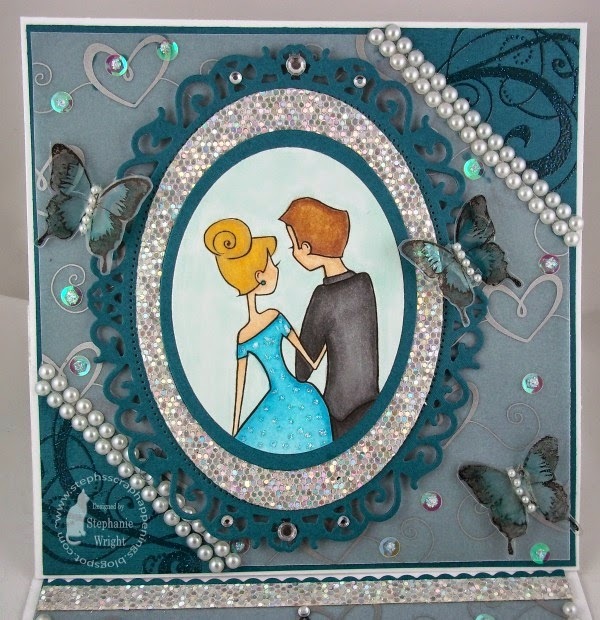 The image of the couple is the "star of the show" on this card. It's a beautiful digi generously provided to me by one of our fantastic sponsors, Sami Stamps. I had to cut off part of the princess' dress when I die cut her but in the original image her dress flows so nicely. After coloring the couple and background with Copics, the image panel was die cut and then triple matted. Some rhinestones were added to the largest die cut. I added dots of Stickles to the princess' dress and earring and added Wink of Stella to her hair. 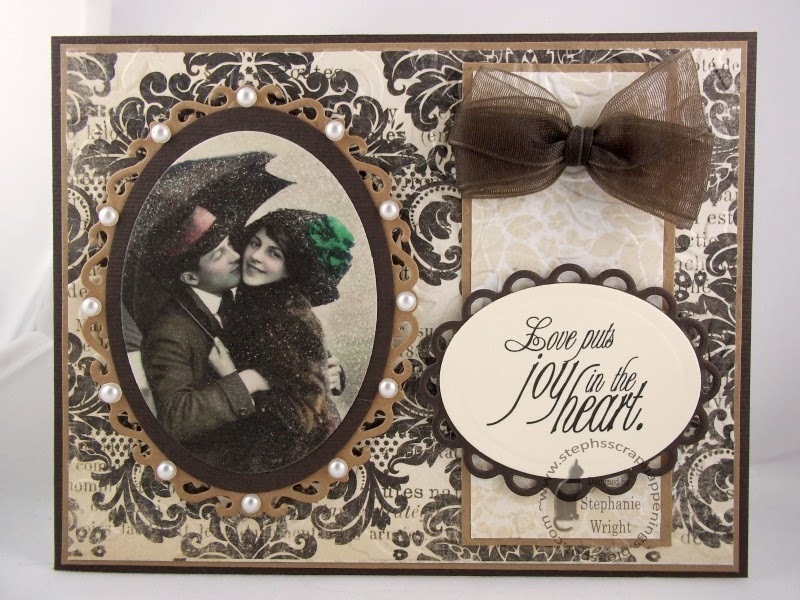 The printed vellum adds to the romantic theme. Some iridescent sequins topped with more Stickles add more sparkle. The flourishes on the corners of the background panel were heat embossed with sparkling embossing powder. This provides a little more subtle shimmer. I tried a "new to me" technique for the butterflies. They are a free digi from Clkr.com. I printed them on acetate. I didn't want the edges of the wings to be quite as dark as they were so I laid them on a piece of scrap paper ink side down (carefully so I didn't smear them) and blotted the ink a bit. Then I left them to dry overnight. I colored the backs of them with two colors of Copic markers and then fussy cut them. When fussy cutting acetate, I discovered it's much easier to put a piece of white paper behind the acetate and cut it out at the same time. It's much easier on the eyes that way. I slightly bent the butterflies in half, then rolled up glue dots into a tube and used them to attach the butterflies to the card. This lets their wings be raised up off the card. Some pearls for their bodies adds the final touch. I used one of my favorite romantic quotes for wedding and anniversary cards on the bottom panel of this 5.5" square easel card. It was stamped with black ink and then clear heat embossed on the printed vellum. More glitter paper and pearl strips anchor the vellum piece and more sequins topped with Stickles adds sparkle. 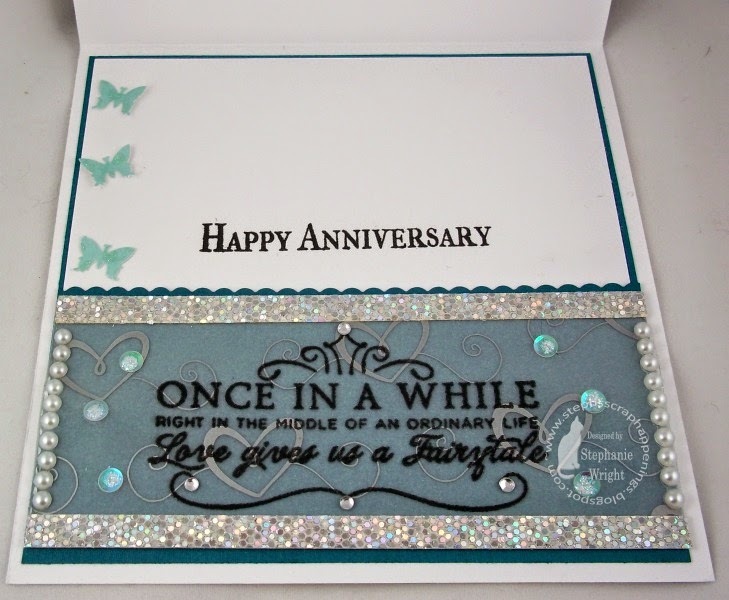 For the rest of the interior, I punched some small butterflies from a scrap of glitter paper and let them fly up the side of the card next to the heat embossed sentiment. They are only attached in the middle so that they also have dimensional wings. Thanks for visiting today. I hope you'll have time to play along in this month's Serendipity challenge at the Path of Positivity. Also be sure to visit both of our fantastic sponsors Sami Stamps and Lunagirl. They have some fantastic images; you're sure to find something you'll enjoy. 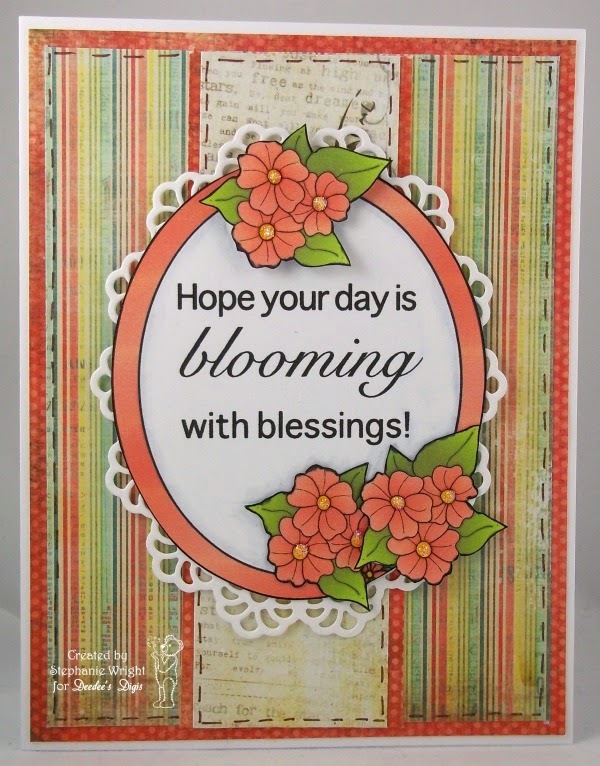 I have really enjoyed my time as a Guest Designer for the Path of Positivity Challenge Blog. Thanks so much to Lisa and the rest of the Design Team for allowing me to work with you!! It's time for another Word Art Wednesday challenge. This week we are focusing on Hebrews 13:5, "Let your conversation be without covetousness; and be content with such things as ye have: for he hath said, I will never leave thee, nor forsake thee." This verse starts with an admonition and ends with a very precious promise. It's so easy to look around at what others have that we don't (health, money, possessions, jobs, relationships, opportunities to be with family, you name it) and want what they have (that's coveting). However, the Bible says that we are to be content with what WE have. Not with what others have but with what the Lord has already given us. Why? Because we have the promise from the Lord that He will never leave us or forsake us. Wow! That is a promise much more valuable than anything else. I really want to remember this the next time I see someone enjoying something I don't have. One of our fantastic sponsors this week is Taylored Expressions. They generously provided some of the Design Team with some stamps to use. I was able to play with Cherish Every Moment. I stamped it repeatedly all over a piece of watercolor paper and then heat embossed it with white embossing powder. I used my distress inks to water color the design. The heat embossing helped keep the colors where I wanted them. When I had the flowers colored, I then watercolored in the rest of the background with a couple shades of blue. Because I didn't want to cover up this pretty design, I kept the rest of the card pretty simple. The Scripture was matted and popped up over a strip of lace trim. 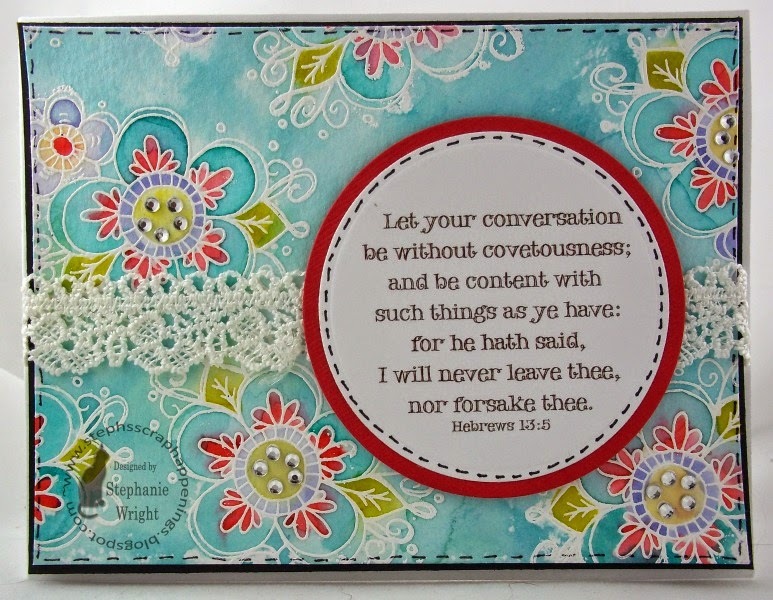 Bling was added to the centers of some the larger flowers and faux stitching around the edge of the watercolor panel and Scripture panel finish it off. I used fun foam behind the watercolor panel to lift it up off the card base. Thanks for stopping by today. I hope you'll have time to visit the Word Art Wednesday blog and see the projects from the rest of the Design Team. I have another child's birthday card to share with you today. This time it's for one of my great-nephews. I used the same balloon stamps as I did on the card yesterday; this time I colored them with Copics and embellished them with a white gel pen. They have DMC floss strings. 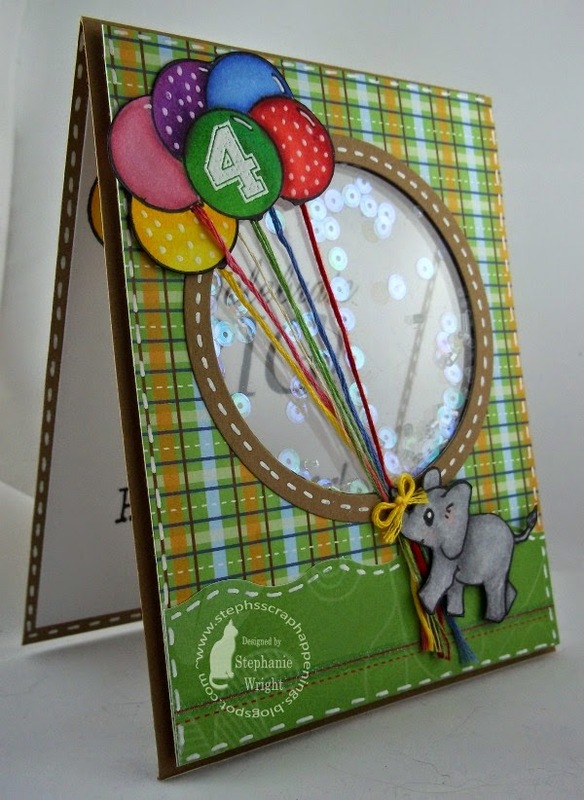 I have a little elephant being carried away with them today and they frame a shaker card. I heat embossed his "new number" on one of the balloons and used my white gel pen for lots of faux stitching. I would have like to have colored a balloon orange to bring out the orange in the paper but my Copic collection is deficient in the oranges. The sequins in the shaker are irridescent. While they look pink from some directions, they look green from others. When I decided to use them, I was looking at them from the green angle. LOL I used patterned paper to make a grassy area for the elephant. Inside are more balloons. Again, these are colored with Copics and embellished with a white gel pen. A black gel pen was used for the balloon strings and bows. Two sentiments and more faux stitching complete the interior decorating. Thanks for stopping by to visit today. Please come tomorrow for a new Word Art Wednesday challenge. Today's card is for a sweet little girl, my great-niece, that just turned one. 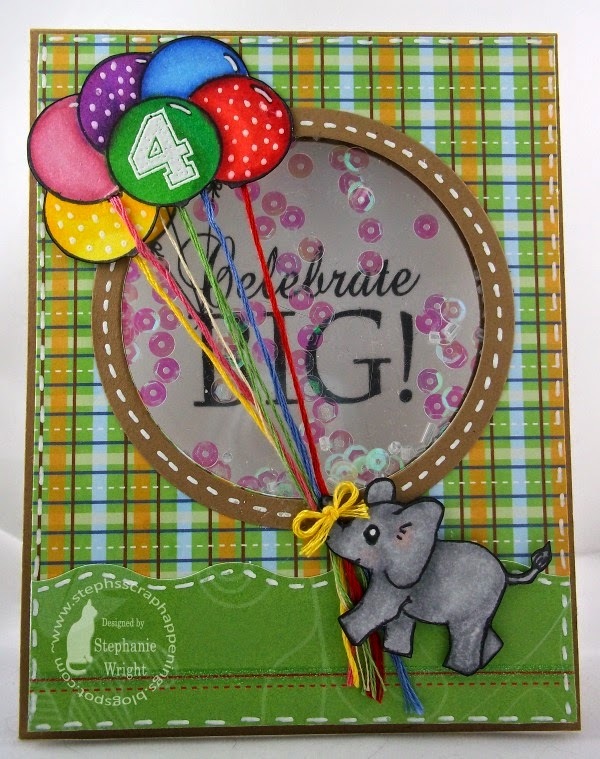 I used my new Mama Elephant Pandamonium set and my favorite balloon stamp set from V's Sweet Ideas. 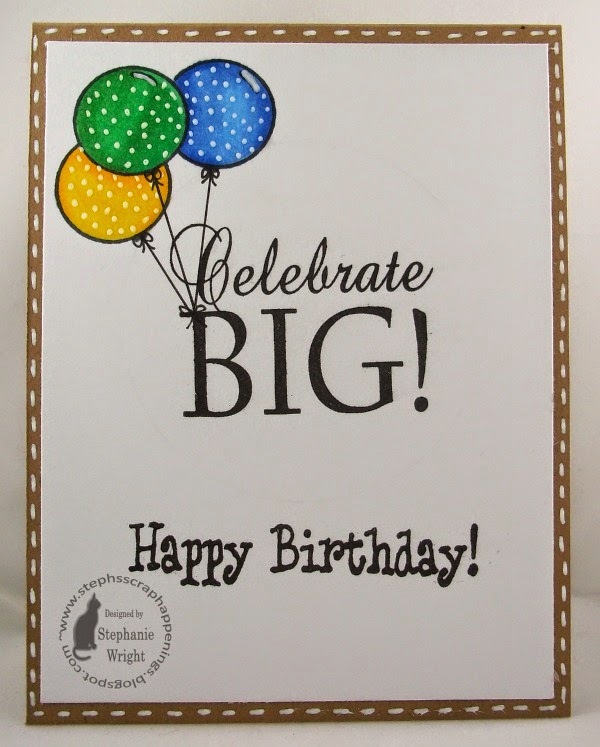 I paper pieced the balloon and heat embossed the #1 on it with white embossing powder. 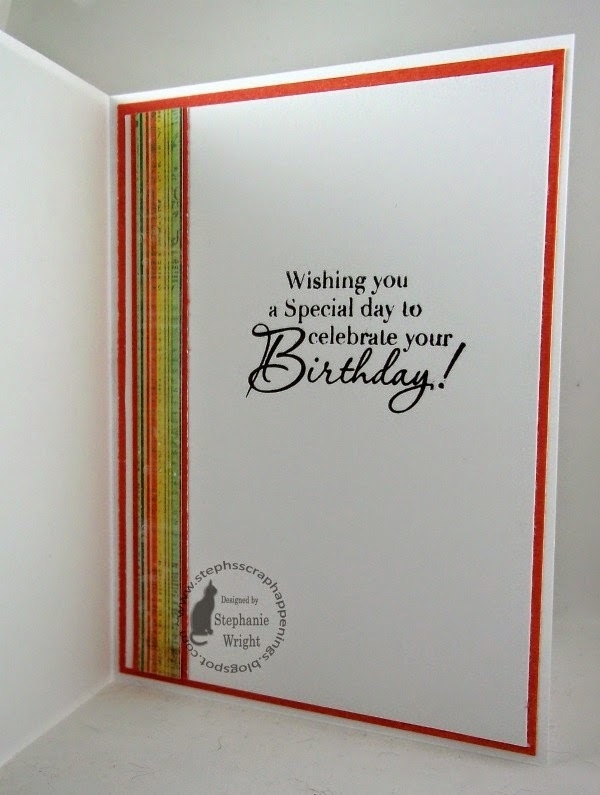 The sentiment was also heat embossed with white embossing powder. 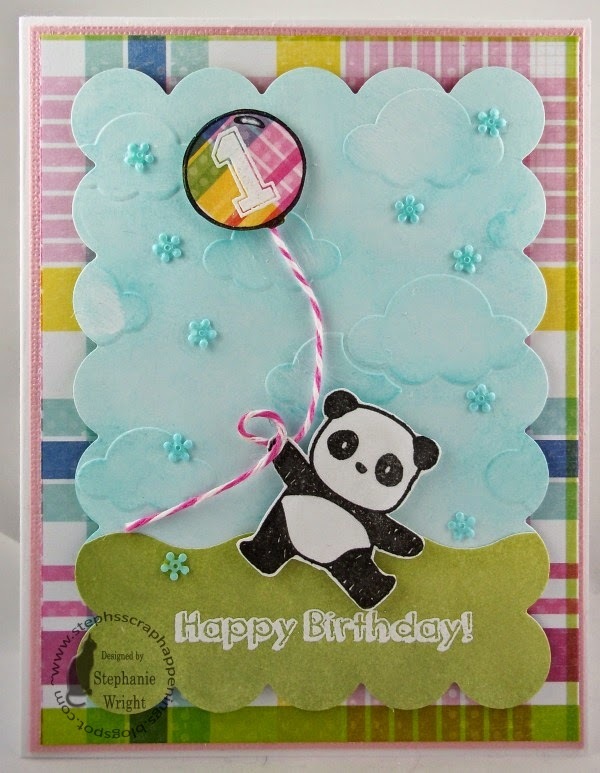 After dry embossing the panel behind the panda, I used distress inks to add color. I used a direct to paper technique to add some white pigment ink to the clouds. More cardstock was inked to make the grassy area and this panel was popped up over the patterned paper background. Some bakers twine and some sequins (also from V's Sweet Ideas) finish off the front. The interior has more paper pieced balloons and another sentiment. 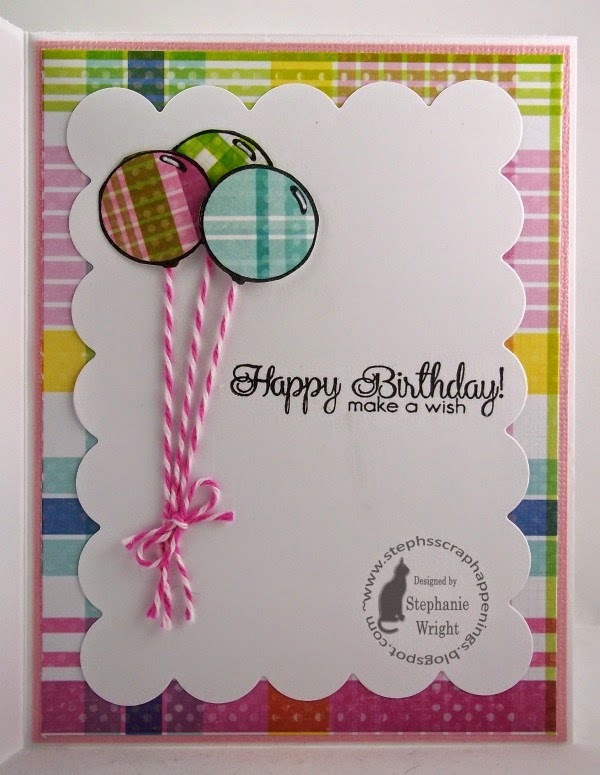 I used the same die cut on the interior and more of the plaid patterned paper. Thanks for stopping by today. I hope you'll come back again soon. It's time for another challenge at Word Art Wednesday. As usual, it's an Anything Goes challenge and a free digi is available for you. You are certainly welcome to use the free digi to enter the challenge but you are not required to do so. As long as your entry is family-friendly and has an up-lifting sentiment, we'd love to have you share it with us (up to 5 projects weekly). Each week we have at least two great sponsors and two entrants are chosen at random to receive a prize. We hope you'll join us. 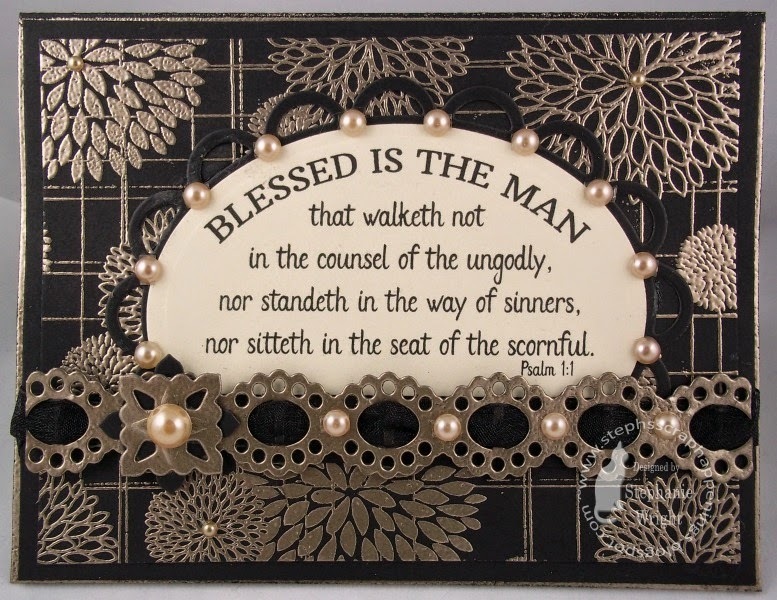 This week our focus verse is Psalm 1:1, "Blessed is the man that walketh not in the counsel of the ungodly, nor standeth in the way of sinners, nor sitteth in the seat of the scornful." Another way to state the word "blessed" is "happy." If you are trying to live a godly life, then you won't be happy if you follow ungodly counsel, spend a lot of time hanging out with those that have habits that don't please the Lord or are always angry and negative. As one of the preachers my husband and I like to listen to says, "He who would not fall down ought not to walk in slippery places." If you want to live a life that pleases the Lord, don't spend your time in places or with people that make it hard to do so. I enjoy watching Jennifer McGuire's YouTube videos and I also follow her blog. One of her favorite embossing powders is Ranger's Liquid Platinum. I was finally able to get some this week and had to give it a try. WARNING: I went a little nuts with it on this card! Now I completely understand why she likes it so much. It has such a beautiful, warm, gold color. It's not a harsh metallic. I used it with a Hero Arts background stamp and some black cardstock. I also made some gold paper by swiping my Versamark pad across my cardstock and then coating it with embossing powder. 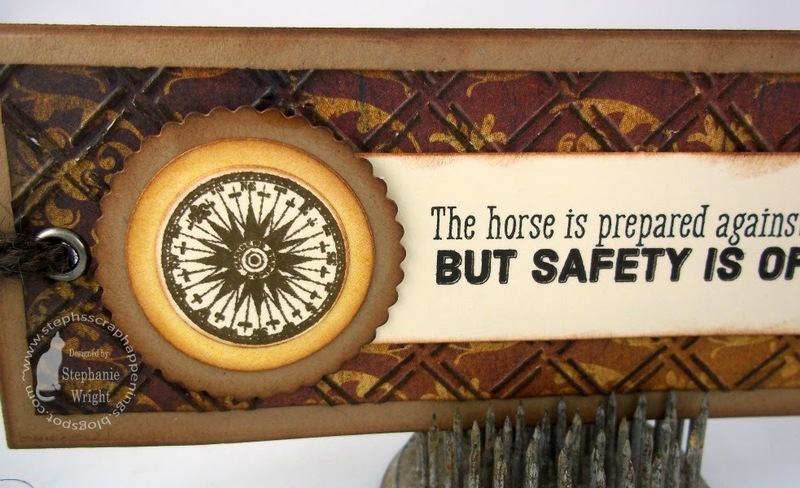 I then cut a border die and accent piece from this cardstock. As a final touch, I swiped the Versamark pad along the edges of the card base and embossed it so I could have a thin embossed edge around the card. I threaded some ribbon thru the die cut border. 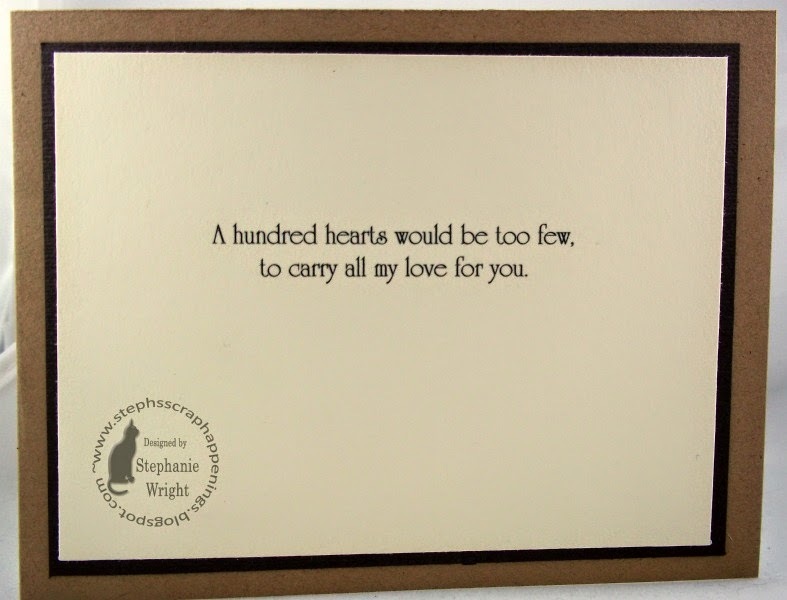 The sentiment was matted on a lacey die cut. 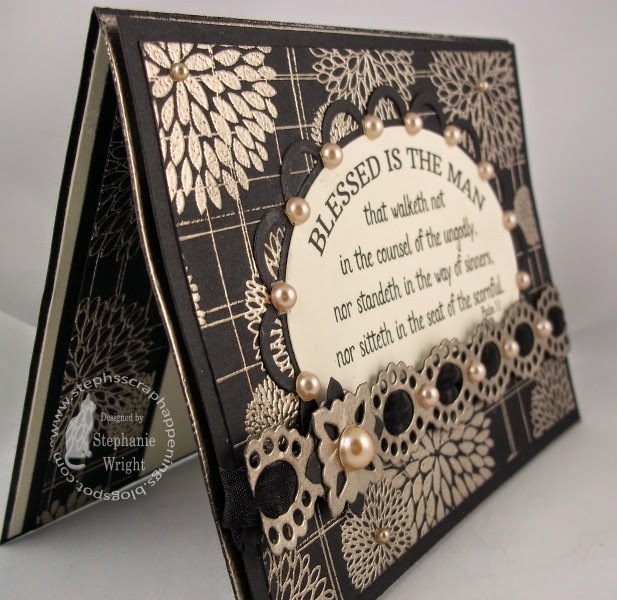 The embossed accent piece was layered over a plain black die cut from the same die. Pearls in 3 different sizes finish off the card front. 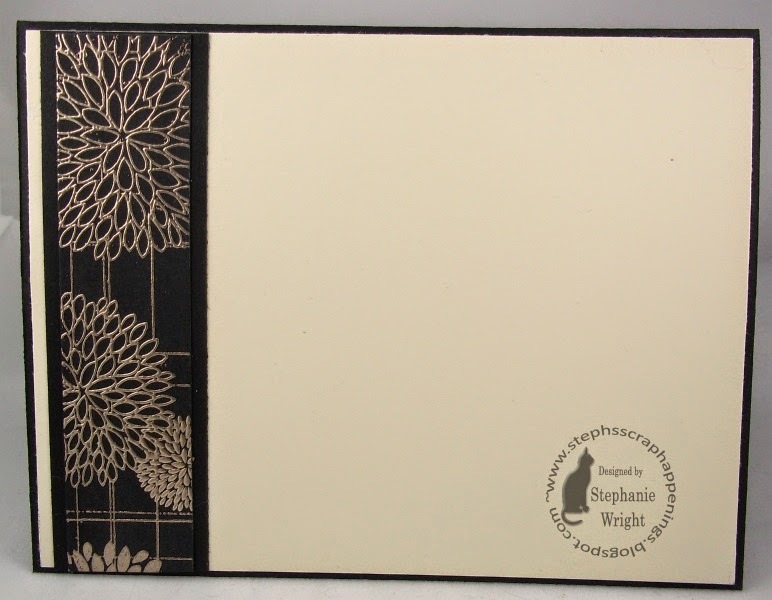 As you can see in the picture above, all the embossing warped my cardstock. I definitely should have used a piece of fun foam instead of foam tape to pop up the embossed panel off the card base. Next time I'll know. I carried the embossed theme thru to the inside by adding an embossed strip along the left side. I told you I went a little nuts with the embossing! Thanks for taking the time to visit with me today. I hope your week is going well and that you'll come back soon. I am very excited and honored to be the Guest Designer this month for the Path of Positivity Challenge Blog. I discovered this challenge blog a couple months ago and absolutely love their focus. The tag line below their blog header says, "A unique challenge blog designed to inspire, nurture and provide support for the soul by creating a positive path to follow, one project or post at a time!" You can find out more about the how's and why's of the blog's origin by visiting this Introduction page. There is a theme word each month and when linking up your project they like you to include how your project goes along with the theme. It doesn't have to be a long explanation, just a sentence or so to help make the connection. The theme word for this month is Serendipity. Serendipity means "fortunate happenstance" or a "pleasant surprise" (source: http://en.wikipedia.org/wiki/Serendipity) or luck that takes the form of finding valuable or pleasant things that are not looked for. (source: http://www.merriam-webster.com/dictionary/serendipity). As a Christian that does not believe in luck (I believe God is in sovereign control of even the minute details of our lives), I'm approaching this theme from the standpoint of "a pleasant surprise." One of the most pleasant surprises I ever received was the night a college group from the college I was attending came to sing at the church my dad pastored as part of their summer tour. At dinner, my best friend arranged it so that I sat across the table from this handsome bass from Kentucky. By the end of the evening, I was asking the Lord to have the handsome singer ask me out when we got back to college and less than a year later I was engaged to him. We just celebrated our 30th wedding anniversary this past December. I didn't know when I went to church that night that it would be a night that changed the rest of my life. Definitely a VERY pleasant surprise. We have two great sponsors this month for the challenge: Lunagirl and Sami Stamps. You can find all the details on the prizes that can be won on the Path of Positivity Challenge blog. Lunagirl generously provided a collage sheet for me to play with for today's card. I used one of the eight images from the Vintage Romance #1 digital collage sheet. The vintage style and I are still working out our relationship (ha!) but this image and these papers just seemed to go together and made it easy for me. 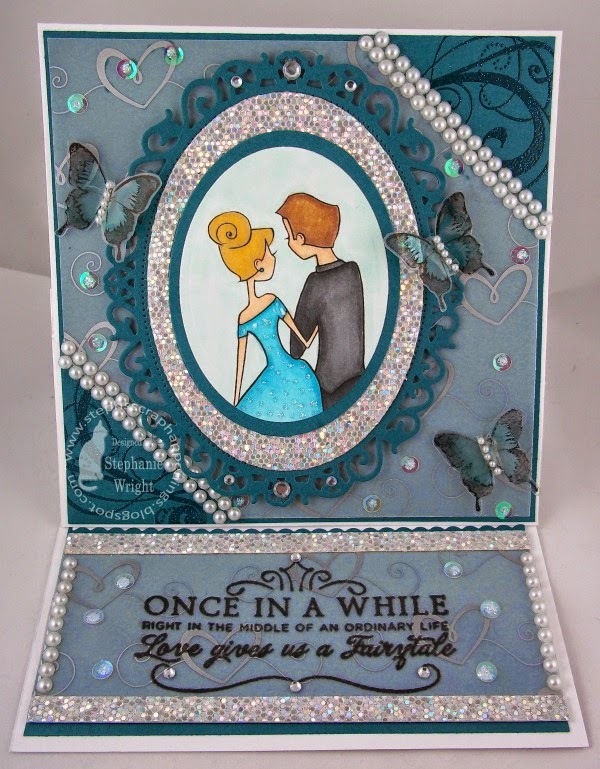 I added some pretty die cuts, pearls, ribbon, dry embossing and lots of layers and the front was done. I kept the interior pretty simple and just printed a digi sentiment and matted it. Thanks for visiting today. Please be sure to check out all the details on the challenge at the Path of Positivity Challenge blog and also visit our sponsors Lunagirl and Sami Stamps.